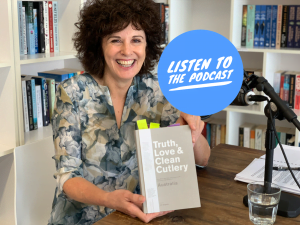 This week Cheryl is joined by Jill Dupleix, distinguished food editor, to discuss her latest book, Truth, Love, and Clean Cutlery. Together they talk about Jill’s childhood and career, and the events that led to her immense love for and appreciation of good food. Since the 1980s, Jill Dupleix has had a distinguished career as a food writer in Australia and in Britain, where she was food editor of The Times for six years. She also writes a fortnightly column in the Epicure section of The Age and is editor of the Good Cafe Guide 2011 .